While the need for a temporary structure crosses every boundary and category, there are three reoccurring reasons as to why a company would choose a temporary structure from Mahaffey: weather conditions, expansion or storage. A budget conscience company must be forward thinking in planning for the unexpected. Will weather hinder any current or future projects? Does the company see a plan for future growth? What type of storage is most feasible for location and price? The most important question lingers: How does this affect the company’s bottom dollar? How can your business maximize your profit in utilizing your rollover budget to save in the future? A meteorologist is the only profession that can produce more errors than correct data and seemingly still be successful. If a scientist fails to accurately predict the weather, how can you? While you may not be able to predict the weather, you can predict that it will happen and more than likely at the most inopportune time. During construction, especially one working with concrete, extreme weather of rain, snow, humidity or heat can cause enormous delays in productivity and completion. This can quickly escalate into a serious loss of revenue. 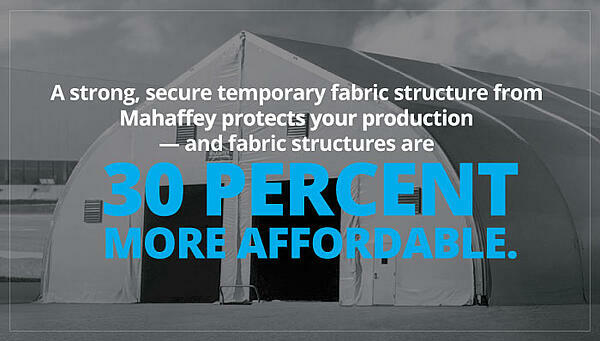 Mahaffey’s temporary structures are engineered to protect both the job site and the workers from the exterior elements. Regardless of the weather conditions, work may continue at a continual pace. Before contacting Mahaffey, a construction company estimated they were losing approximately $100K per week due to weather-related delays. They were unable to pour concrete for the job without rain refilling each of the drilled holes. The company was at a loss both figuratively and financially until contacting Mahaffey. For this very reason, it is crucial that businesses think ahead of future job sites and maintain a “rainy day” fund, so that operations can be kept at a maximum pace and any lost time or resources are kept at a minimum. Every company hopes for growth; however, not every company prepares for it. The manufacturing industry has maintained a steady uphill trend over the last decade. This continued growth has paved the way for expansion opportunities for businesses. Companies must be adequately set-up to handle the new opportunities while sometimes at a rapid-fire pace. When a company is faced with an immediate need for growth they have two options: devise a plan to build or house the expanding operations or to stay stagnant and refuse growth. Given that most companies would choose the former option, what does expansion look like then? The construction of a large project entails expensive equipment, large crews, multiple stakeholders and lengthy timeframes. With so many intricate pieces to the construction process, there are bound to be complications and unexpected costs. According to a report by McKinsey Global Institute, large-scale projects typically take 20 percent longer than originally scheduled and can be up to 80 percent over budget. Thus, this is why companies are looking at building alternatives. 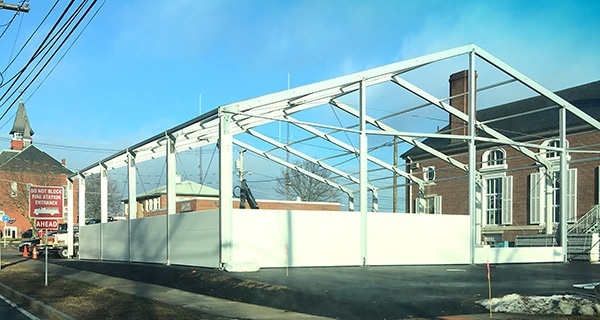 Mahaffey temporary structures offer a large cost savings, can be installed quickly and just as easily moved or modified to continue meeting the customer’s needs. Besides your “rainy day” fund, maintain a fund for growth. Be prepared for possible expansion. Don’t miss the train. When projecting a rollover budget, one of the sources to review is any hidden variable expenses. An example of this type of expense is storage. 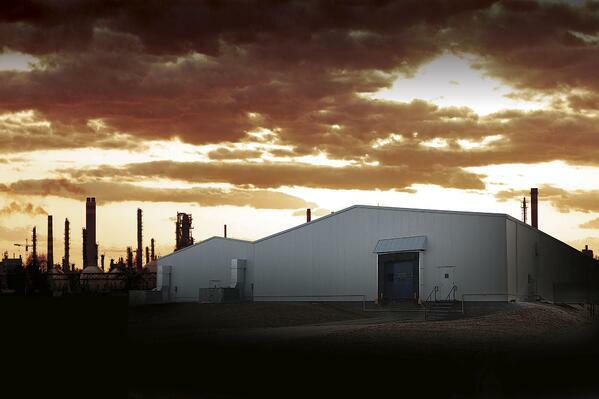 Mahaffey temporary structures offer quality storage and eliminate any of the hidden storage fees. 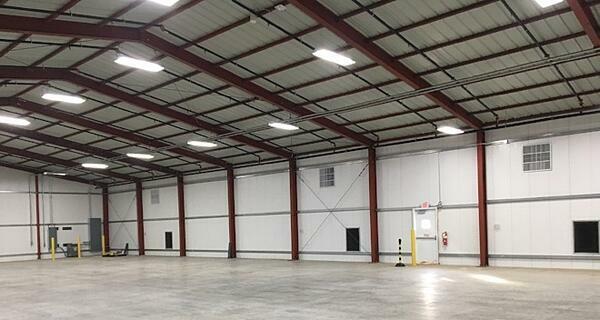 Storage facilities are an ever present need for any construction project. The type of and location of the storage facility are variables that make a large impact on a company’s bottom dollar. When a storage facility is off-site, there are additional expenses including fuel, vehicle maintenance related to driving supplies and equipment to and fro the job site and hours of lost productivity while employees make the commute. Having a storage facility near your job site eliminates the wasted time and the wasted wear and tear on the equipment all while keeping your assets protected. A Mahaffey client recently reported saving $14K a month by moving an off-site storage to an on-site temporary warehouse. While the decision may seem insignificant to the company’s budget, the dividends are astronomical. When looking for ways to allocate your company’s rollover budget, be advised to always plan for the future. Save today, so you are prepared for tomorrow. Give Mahaffey a call and let them guide you how best to prepare for your company’s success in the future.